Spirituality. The history of Buddhism, its effect on life perspective and human conduct. The power of Buddhism and message of compassion. The importance of trees in Buddhism and on temple grounds. Culture. Thai culture emergence and in context with other great civilizations and the ecosystems that support them. The tree and forest in Thai culture, history, and modern times; the blend of Buddhism, trees and conservation in Thailand. Conservation. The dilemma of modernization and forest destruction. 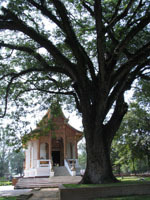 The need for tree conservation in Thailand and elsewhere; the lessons temple trees and sacred sites in general have to offer the human prospect. Protecting and preserving Thailand's cultural history and spiritual tradition includes respect for natural history and conservation of biological heritage. In fact they can all support and enrich each other. As a tool for environmental education, we believe this nexus has much to offer, wherever trees and the idea of the sacred can be found. Join us and enjoy. We welcome your feedback and encourage your own exploration of how trees, culture and spirit come together.